Technics KN7000 combines musical excellence with Digital Networking and the powerful SD Memory Card. This creates one of the most incredible keyboards ever. Add to this Technics' design excellence and the stage is set for something outstanding. Sound Quality is a Technics Institution. The KN7000 creates amazing sounds that are literally digital recordings of real instruments. This is the Dynamic PCM that puts realism at your fingertips. The KN7000 has a potent sound engine with 128 note polyphony, and 64 Mbytes of samples bringing you over 1200 sounds. From Soloist sounds to detailed nuances of virtuoso musicians performances or even Live drum kits bringing you a full live percussive sound perspective. Organ sounds include majestic classical presets, great tone wheel and rotary speaker samples and a choice of 3 new organ tabs. Having a karaoke ? , plug your telly into the back and the KN7000 screen is projected onto your TV screen. 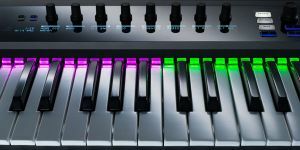 The Technics KN7000 keyboard features a brand new speaker design, which utilises a rear facing bass port delivering awesome bass power. The newly positioned tweeters give a degree of separation and sound projection that is superb. You can apply enhanced DSP effects separately to Right1, Right2, Left, and APC parts, as-well as global effects like chorus and reverb. The Technics KN7000 is equipped with both a global sound equaliser and a separate equalisation function for each part, you can create studio like mixes with excellent sound quality. The Technics KN7000 digital piano features a USB port, so you can link to a computer. The program provided will allow you to create midi files or even audio files that you can send to your friends via email or even create your own CD's. A new UK resource for the Technics KN7000. TechnicsKN7000.com is a reproduction of the original companion website released by Technics for the launch of the Technics SX-KN7000 keyboard. It is a valuable resource for finding out about the KN7000, including software, manuals, demos and downloads.